CEO Kurt Wilson of Hyperform Inc.,“Founder of the Year” Finalist! We are pleased to announce that our client Hyperform Inc.’s founder and CEO Kurt Wilson is a finalist for the Founder’s Forum “Founder of the Year” award. Additionally, Wilson was featured in the latest edition of Space Coast Living Magazine, along with three other finalists. Hyperform Inc. is a manufacturer of innovative products that began with fiberglass surfboard and sailboard fins in 1984. Eventually, they began to experiment with closed-cell EVA foam as a non-skid decking solution that ultimately led to SeaDek. It quickly became an evident leader in the market for their products in the marine decking industry. After their purchase of a brand new manufacturing facility as a result of increased demand, Hyperform created SwimDek to offer their innovative product lines to the pool and spa market. 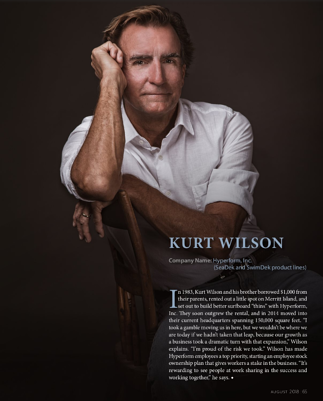 We celebrate our client Hyperform Inc. and founder and CEO Kurt Wilson! Way to go! For more information, please visit: http://www.hyperforminc.com. Hyperform Inc., Making a Splash!